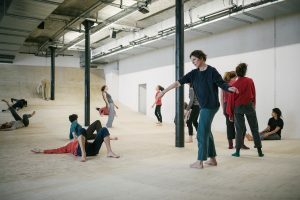 On July 22nd and 24th of 2016 Brazilian choreographer Thiago Granato – whose performances “Basement” (2011) and “This is concrete” (2012) have received much attention – performed Treasured in the Dark at the Schauspielhaus, as part of the ImPulsTanz – Vienna International Dance Festival and as the first part of a trilogy titled CHOREOVERSATIONS [This trilogy that combines research and artistic creation is based on imaginary and “concrete” collaborations with dead, living and future choreographers.]. Treasured in the Darkinvokes the ghosts of Tatsumi Hijikata (Japan/1928-1986) and Lennie Dale (USA-Brazil/1934-1994) during a spiritism session combining the darkness of Butoh (舞 踏) and the “calor” of Tropicalist Brazilian Modern Jazz through a series of wonderful metamorphoses. Thiago Granato is acting on a dark stage framed by a black curtain at the back; The performance begins with a tenuous light pointed towards him, dressed in black with a boa scarf and his body “singing” in a bawdy manner. With few gestures, Thiago Granato grasps the transgressions of Tatsumi Hijikata and Lennie Dale in specific historical and political contexts: Post-war Japan and the military dictatorship that ruled Brazil between 1964 and 1985. 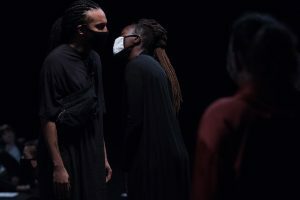 Thiago Granato invokes the two deceased dancers to treat subject matters who are still present: protesting in the streets, demonstrating on stage, putting oneself forward on stage. Thiago Granato, performing inside and outside these lights that separate the visible from the mysterious, engages in a struggle against political oppression, the one that is exerted on him and the one he exerts on himself. A claim expressed by a series of movements, randomly performed, boa feathers scattered across the floor. A struggle interspersed by strobe lights, his movements based on those of Tatsumi Hijikata, punching the air, fighting the air of oppression, attacking, defending himself in the irregularity of the flashes, the invisible as an alternative of the gestures. A struggle extracted of its political, social and economic context through the obscurity. A struggle brandished by Thiago Granato with a large aluminum flag which gives off uncountable shimmering reflections and whose rustling has uncountable tones. The waving, fluttering, ruffling movements of the anonymous flag are reminiscent of the ways a flag unifies and divides, the ways it gathers what once were the hopes and fears of Tatsumi Hijikata and Lennie Dale. 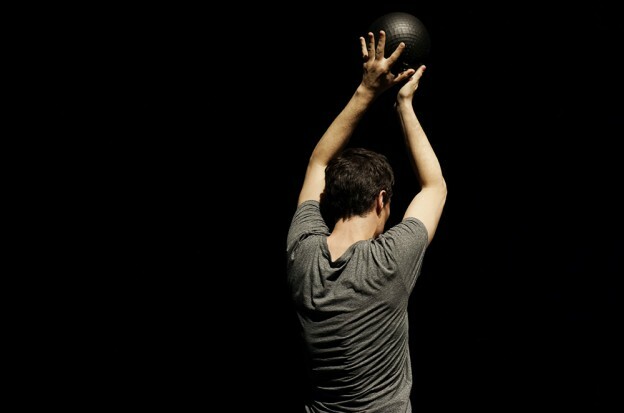 Thiago Granato uses props and gestures while remembering the lessons of Butoh and Brasilian cabarets : the stage is suggestive in the sense that a small sphere can become the center of the world and a simple gesture can become the focal point of the audience. Both can be rendered precious, even in the darkness, thanks to darkness; A darkness that reveals the treasures of our imagination. Could you explain this fictive exchange between Tatsumi Hijikata and Lennie Dale wich is part of the project “Choreoversations”? In 2013/2014 I had an artistic residency at Akademie Schloss Solitude in Stuttgart and the philosophy of this institution is to offer the time and space for artists to do what they really want to do following their own agenda, without having to show the result of it if they don´t want to. I applied to take part of it with a research/choreographic project that had the aim to develop an artistic working methodology. 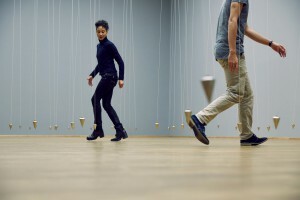 To make this research happen I would have need other artists to work with since it was based in creating different performative modes of echoing works that already existed in the world. First of all, I was interested in knowing every fellow who like me was participating in the program (we were around 30 people from different fields) in order to know if I could work with some of them for my research project. By doing this I started to get interested not only about in people were doing, since most of them were from other fields like sciences and business, but also about how they were speaking about what they were doing. So the format of a conversation (which was already present in my previous works like Basement in 2011 and This is concrete in 2012) came back again as a way of producing knowledge but with a different focus since this time the aim was to create a working methodology and not necessarily an art work. 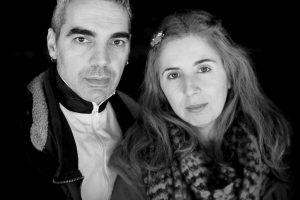 In parallel, I started to look for some literature of conversations between artists like Hitchcock and Truffaut, Lygia Clark and Hélio Oiticia, Interviews by Clarice Lispector, etc. After reading some and identifying different ways to deal with the format I wanted to translate those different ways into the logics of the choreographic practices which I used to have in order to see what it would produce. The first idea was to invite two choreographers to have a conversation, a choreographic conversation using my body as a medium. I made some experiments and they were problematic enough (in a good way!) for me to understand that it would be a very interesting way to develop a project that could combine research, creation, production and education. I made a list of choreographers with whom I wanted to work with and I started to contact them and invite them to work in the project. For different logistics reasons of working with those lists, I started to question myself if I really needed their presence to work with them. Since a lot of information about those choreographers was available on the Internet I thought that I could use this information and imagine their presence in my creative process, like creating a kind of “avatar” to work with. That was liberating! After that I thought that if I didn’t really need their actual presence to work with them, I could also work with choreographers who are already dead and thus with choreographers who are not born yet. These three different kinds of presence, passed away, alive and not yet born, gave the outline of this trilogy that I´m currently working on called “Choreoversations”. I decided to start working with the passed away choreographers and from the list of late choreographers with whom I wanted to I “invited” Tatsumi Hijikata and Lennie Dale. Tatsumi Hijikata has always been a reference for me. 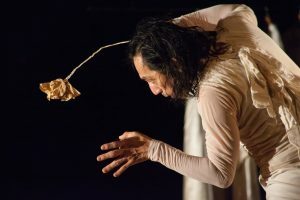 The basis of his Butoh technique was always very inspiring and helped me to understand how to work with immaterial forces and imagination as a motor for moving. His life, work, country, culture were very fascinating since I learned about him when I was a teenager dance student. He also has a very mysterious biography which provokes a very creative exercise of trying to grasp who this amazing artist was and how he developed his impressive work during a very complicated period of huge cultural and political transformation in Japan. Lennie Dale was also on my list. I heard about him through the choreographers that I had worked with in Rio de Janeiro. He was a very influential artist in Brazil and he made an exceptional work as a performer and choreographer of the group “Dzi Croquettes” (a queer dance-theater-cabaret group) which combined humor and political criticism under, during the most severe dictatorship in Brazil in the 70´s. In my personal way to look at them side by side I get the impression that they were living in a kind of similar oppressive social and political environment but expressing their resistance through very distinct aesthetics. One with the surreal and obscure Butoh dance and the other with the tropicalist Brazilian Modern Jazz, but both were producing a kind of metamorphosis of the body as political subversion. It was common to see them performing their pieces half naked, with the body painted in a precarious but very well constructed look, cross dressing, etc. Despite the different energies there were many resonances between their performances. To bring those people together today in this way seems to be a very relevant act for me as I think the world of today has a similar political situation of those times regarding the rise of right-wing movements. It is interesting to see how the audience projects on the images and situations of Treasured in the Dark the political struggle that they experience in their own environment. And building on these two choreographers, how did you conceive Treasured in the Dark? The question of presence became very important in the conception process. From the beginning I knew that I didn´t want to make a work about them. The idea was always to imagine what they would do with me if they were still alive. So I had to imagine their presence which of course enhanced the feeling of their absence. To solve this paradoxical situation and to be creative about it I had to invent situations where I could produce signs to fictionalize their presence in order to communicate with them. For example I proposed to Lou Forster (one of my artistic advisors) an email exchange in which I pretended to be Lennie Dale and him Tatsumi Hijikata. This task became a very interesting way to combine historical research, since we had to use the information that we found about them, with a creative way of imagining what they would converse about. I also used a card game, “Oblique Strategies” from Brian Eno and Peter Schmidt, which is a collection of sentences that they collected during years of research, to give a voice to the spectrums of Lennie Dale and Tatsumi Hijikata. I met people that worked with Hijikata and Dale and had long talks with them, such as the choreographer Larry Vickers in Paris when I was working on this project during a residency at Les Recollets. Larry knew Lennie Dale and he told me that he could feel Lennie Dale’s presence before Lennie would arrive in a space due to his expansive way to take the space (laughs). He said that something in the air changed as well as the sound that he produced… I can imagine that! Well, this is not so difficult to imagine. There are some people who have this kind of energy! I know some. By creating those situations I realized that there are many different kinds of presences beyond the common notion of “here and now”. For instance you can think that some people are getting more present in our live after their death, or also the presence of the baby during pregnancy, or the presence of sleepwalking, or the presence of someone who is yet to come, and so on… So, a catalogue of different kinds of presence connected by different processes of metamorphosis was the basic basis of Treasured in the Dark. Could you tell me more about the title Treasured in the Dark (who underlines the fact that something becomes precious in the dark/that the darkness gives a preciousness to something)? Both choreographers were bringing up in their works and lives (which were one and the same thing) a range of social and existential aspects of life which were (and still are!) considered the dark side of the human being in friction with society. Both of them were very connected with the night life, showing their works most of the time in night clubs and giving visibility to a marginal way of living. Their biographies are very mysterious, full of obscures histories… They were figures of ghettos using their bodies as “flags” for the political resistance. All this darkness around them is what makes them shinning as artists. But of course this is how I look at them when I imagine them close to each other, it ´s all about perception, or how to look at something in a specific way. To treasure something in the dark means to appreciate something in a specific environment. Regarding the scenography, there are very tiny lights. They are very important during the whole performance with white, yellow, blue and red lights. How did you manage them? What is it we can and cannot see? What are you seeing in or outside the light, by the lights? We wanted to create a feeling of abrupt transformation in the body together with its environment like when a caterpillar becomes a butterfly or when you meet someone that know appears dressed in a totally different way… We were not interested in showing a slow process of transformation; we wanted to produce a very clear and radical sense of change. To make it happen we used this strategy of changing all the parameters at the same time (body, light and sound) so that the audience and I on stage can fell with all their senses a clear change of the reality happening. The sequences are very different : The humoristic beginning, the fight scene in the dark, the silent end with the flag.. The first scene works as a prolog with this reference to drag queen shows. Lennie Dale was a drag queen. This first scene is a way to synthesize the meeting between Lennie Dale and Tatsumi Hijikama. It was supposed to be glamorous, like cabaret but there is the scatology of Butoh because of the way the body is exposed. Tatsumi Hijikata and Lennie Dale condensed in one image. As the first scene of the piece it works as a weird contract with the audience: easy/funny and suspicious/sad at the same time, like in the uncanny logic. All the different scenes that follow are connected by big changes that transform the nature of the choreographic material but every new scene carries something of the previous one, again like a caterpillar that turns into a butterfly. You can see the caterpillar in the butterfly even if the butterfly seems to have a totally different structure. What is at stake for me is the metamorphic way of changing the body into different kinds of corporalities. The scenes have different kinds of organization. Some are totally written and some have a choreographic structure that works as a map which I follow while improvising movements in between. Every section, improvised or not, has as principle of transforming different forces (feelings, sensation, vague memories, etc) into signs in which I can recognize the universe of Tatsumi Hijikata and Lennie Dale. This game of playing with the capacity of the body to transform forces into signs and vice-versa is the core of all scenes. A very clear example of it is when the very ambiguous sound in the darkness (kind of crowd voice, swarm, rain…) is transferred to an object which is a silver flag being waved by me on the stage. A very imposing silver (aluminum) flag which is anonymous.. The flag appeared from a metaphor that I used to name the kind of body that those choreographers were producing by that time which was “the flag body”. It was common to hear from a disciple of Tatsumi Hijikata this sentence: “you don´t do Butoh, you are Butoh”. Also from the “Dzi Croquettes” crew (the Lennie Dale´s group): “you don´t play Dzi Croquettes, you are Dzi Croquettes”. All of them were carrying a very strong ideology in their works and their works were clearly not dissociated of their bodies. So the flag-body was a metaphor that helped me to relate with them. The sound of the flag, which is a very strange and ambiguous sound, appears in the piece before the image of the flag and that is the transformation of one kind of body into another one in a metamorphic way. The flag is silver and it reflects the images of what is happening in the space. It can also mean that the flag can reflects what the audience is projecting on it. What will be the second part of these “Choreoversations”? The premiere of the second solo is in November in Brazil. I received a prize there called “Premio Funarte de Dança Klauss Vianna 2014” to produce it. 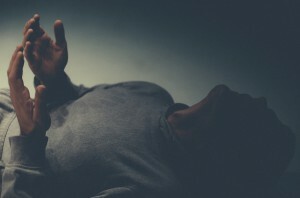 I invited two Brazilian choreographers with whom I’ve already worked, Cristian Duarte and João Saldanha, and the choreographic conversation between them is also around the metamorphosis of the body but with the difference that for me the big question now is how to deal with different ways of listening. If in the first solo the problem for me was the presence (since the choreographers where not really there with me), in this second part the problem is how do I listen to them and how do I make them listen to each other (since they don’t meet personally, only trough my body). The name of the solo is Trança, which means “braid” in English. And for the third solo of the trilogy “Choreoversations”, as you know, I will invite choreographers who were not born yet… but this one is still in a research phase. Interview conducted on July 25th as part of ImPulsTanz. Photo © Carolina Mendonça.